40th Birthday Celebration Conventions - Misc. The United Elvis Presley Society Knockin' 'm dead in Knokke, Belgium Close to one thousand people celebrated the 40th anniversary of the Belgian Elvis Presley Society last Saturday in Knokke, near the Belgian coast. Opener of the show was the wonderful King of Belgium Band. TV-personality Bart Herman and Belgium's leading lady of country Music, Miss Barbara Dex kicked off the evening with their versions of Elvishits such as "Blue Suede Shoes", "Love Me Tender" (duet), "Burning Love" and "Trying To Get To You". 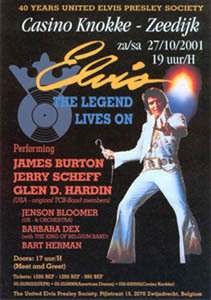 Bart Herman did "If I Can Dream", while Miss Dex amazed the audience with top-class versions of less known Elvissongs, such as "It's Still Here", the to John Wilkinson dedicated "Early Morning Rain" and a steamy "Feelin' In My Body". Barbara Dex may be a crowd-puller in Belgium, still most people drove all the way to Knokke to see the Giants of Rock in Concert: Glenn D. Hardin, Jerry Scheff and Mr. Guitar Himself James Burton. Jenson Bloomer took over Elvis's part. For one hour and a half they rocked the house like nobody ever did before in this old, prestigious Casino. Show-topper was an incredible version of "Suspicious Minds", that probably took eight minutes. Another highlight was "Hurt", where Jenson Bloomer proved that, indeed, he's got what it takes to share the stage with TCB-legends. At the end of the show, the Board of the fanclub presented Hubert Vindevogel with a plaque and a framed CD that contained Hubert's favorite Elvissongs. The icing on the cake was an impromptu version of "Reconsider Baby", a special request by Hubert himself. It was way past midnight when the last fans returned home. Happy, satisfied and with signed album covers. It's Elvis Time The theme for the convention of the Dutch Elvis Presley Fan Club "It's Elvis Time", the anniversary, drew a lot of people to Dordrecht. Probably because the crowd that was gathering already, the doors opened long before the announced time of 13.00. Soon it turned out to be too busy since not everyone was able to find a seat in the theatre. After a minute of silence for the victims in the U.S., the show started with "a surprise", at least for the people that are not familiar with the Internet. The Dutch singer Lee Towers gave a short show of Elvis-songs, while in between he got the news that from now on he is a member of honour of the fanclub. Most people seemed to enjoy Lee's show or were at least happy he wasn't wearing a jumpsuit (Lee always wears a tuxedo or a black suit). After Towers we got a screening of "That's The Way It IS, Special Edition" (and not, like the announcer said twice "TTWI Was"). The screening was on a "big screen", well, that might have been when you were on the front row. A bit further to the back it was like you were looking to your own TV-set. A pity, but it doesn't make the movie less and gave people a good opportunity to have chat with this great music in the background. After TTWII another Dutch performer, Rene Schuman, did his trick. Rene is better known in the Elvis-world, he even appeared in Memphis as guest of EPE, and once again he showed why he is popular. Without trying to be Elvis he did "unknown" songs like "Angel", "Mine" and "Almost in Love" with such an ease, it was really impressing. In between he did better known Elvis songs and also some tracks of his own new CD. After the spotlight went to Mr. Haan, president of the fanclub for the last 20 years, the big moment got closer and closer. The TCB-band (unfortunately without Ronnie Tutt) was going to appear together with Mondo Carne and Jason Bloomer. From the first beats until the very end they turned the theatre into a big party scene. They gave a fantastic show, having great interaction with the audience. Glen, Jerry (in spite of a flue that caught him) and James were marvelous as ever. Bloomer showed he knows the classics, and worked through the songs with a tremendous voice. Not only songs from "Elvis The Concert" were done, but also masterpieces like "Trying To Get To You" and "Mystery Train/ Tiger Man". A real tribute to The King and again it was proven that one doesn't need a jumpsuit to do that, "au contraire", as the French say. All in all a good convention with a good atmosphere and looking at the crowds that gathered, Elvis is still very much alive in The Netherlands.